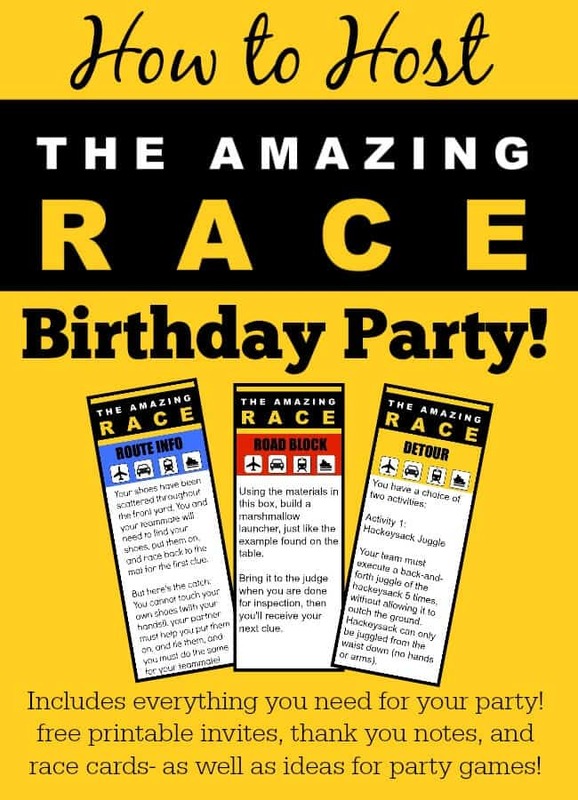 *Please note: I am just a parent who is a fan of the hit TV show “Amazing Race” and created an Amazing Race birthday party theme that celebrates the fun of the show. This post is in no way affiliated with or endorsed by CBS or The Amazing Race. All ideas and opinions expressed here are my own. 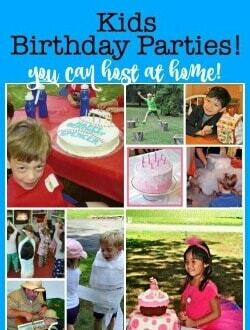 I LOVE throwing fun yet easy kids birthday parties at home! Over the years I have done a ton of them- but the one I've done more than any other is our “Minute To Win It” themed birthday party. It has fun games, it keeps active kids engaged, and it is so simple to put together. But this year I thought I would create a party around another favorite TV show in our house… “The Amazing Race”! We watch it together as a family on Sunday evenings, and I knew my kids would LOVE an Amazing Race birthday party! 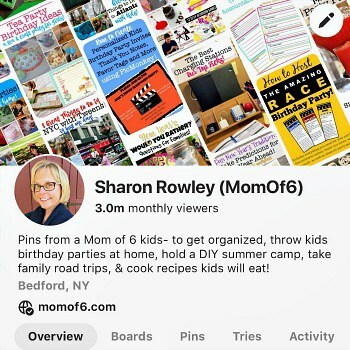 If you look online, you'll see lots of ideas for holding an Amazing Race party that involves teams paired up with Moms and Dads as drivers, conducting the race throughout their hometown. But these parties take some more significant set-up time, and you have to work with local shopkeepers to help with game participation, plus it means securing other adults to serve as team leaders and drivers. The other downside is that your birthday party guests are spread out all over the place playing the game as they race around the town, so you are missing the change to enjoy each other's company! I created these cool party invites which can be printed and mailed or sent out as an email attachment. You'll find a download link to the printed invite at the end of this post. When kids arrive, you can draw names in pairs from a hat to make up teams. Hand each team a pair of tee shirts in a different color This is an affiliate link: MomOf6 earns a commission if you purchase, at no additional cost to you. (blue team, red team, green team, etc.) and then ask the players to remove their sneakers and put them into a bin so that one of the adults can scatter the sneakers throughout the yard for the first game! Then hand each team an envelope with this logo on it (you'll find it in the download at the end of this post). You can pick up a stack of tear-open sealable envelopes for free from the post office (of course, they aren't exactly meant for this purpose…) or order some here This is an affiliate link: MomOf6 earns a commission if you purchase, at no additional cost to you. and then print the Amazing Race logo below and glue it onto the outside of the envelope. You can make this as difficult as you'd like- making the ribbons on the trees This is an affiliate link: MomOf6 earns a commission if you purchase, at no additional cost to you. themselves tiny and hard to find or scattering dozens or even hundreds of coins around the tree- allowing only one coin to have the correct birth year on it, etc. Hand the builder a box of materials to build the marshmallow launcher (please check out this fab post from Grandma's Briefs to see how the launcher is constructed). Before the party, you will need to build one example launcher, using a plastic cup This is an affiliate link: MomOf6 earns a commission if you purchase, at no additional cost to you. and balloon This is an affiliate link: MomOf6 earns a commission if you purchase, at no additional cost to you. 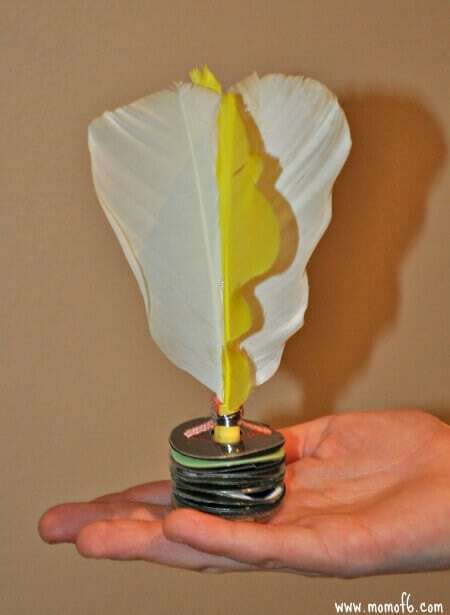 , that the kids can look at as a model, but they will not receive instructions for making their own launcher. They must look at the example and construct their own as best they can. Have a stack of plastic beach buckets This is an affiliate link: MomOf6 earns a commission if you purchase, at no additional cost to you. ready as well as a bag or two of marshmallows and let the kids launch the marshmallows into the bucket! Take a shoebox and cut a round hole in the lid just big enough to allow a ping box to shake out if you are shaking the box. 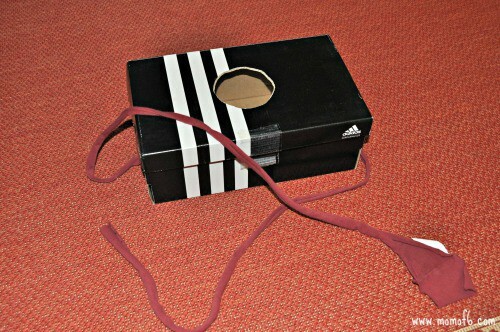 Now attach a long piece of fabric to each side that will let you tie the box around your waist like a belt. Not Into These Games? Change it Up! You can customize your Amazing Race game to include whatever wacky crazy party activities you'd like! I've included blank route info, detour, and roadblock cards in the downloadable game file at the end of this post that you can use to construct your own version of the game! A simple sheet cake iced in yellow with the Amazing Race logo would be perfect. You can use black, yellow, and white fondant This is an affiliate link: MomOf6 earns a commission if you purchase, at no additional cost to you. and icing to create the logo, or if you'd like an easier way out- take the logo to a bakery and have them create the cake for you! Ready to Download The Free Amazing Race Party Printables? Awesome! Simply sign up below to join the MomOf6 community, and you'll be directed to a thank you page with access instructions! The download includes the party invitation and thank you note, as well the blank and pre-printed game cards! Please note that these printables are for your personal use only and are not to be distributed or sold. Would your son or daughter love this Amazing Race birthday party? I'd love to hear about it if you hold one too! 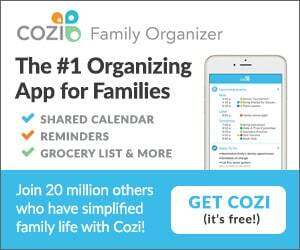 « Summer Chore Chart for Teens and Tweens! I would really LOVE this Amazing Race party supply pack. Please can you let me know the easiest and most cost effective way of getting them from you. We absolutely love the game and my kids are very very keen to do this for their birthday. Thank you so much for sharing your amazing ideas!! I am trying to download the Amazing race party templates. I subscribed to your newsletter but it isn’t downloading anything on my computer. Is there another way to get these files? 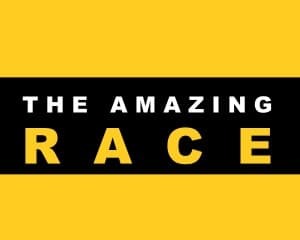 What font did you use for AMAZING RACE? It took more than an hour to complete! 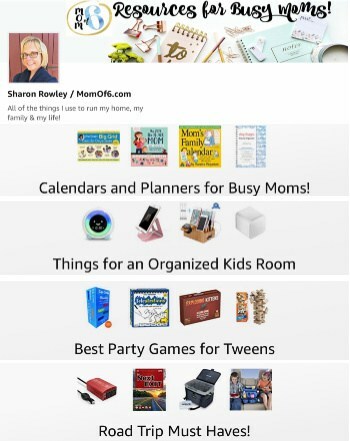 Sharon, I love your ideas and I can’t wait for my son’s birthday this next month! I do have a question regarding the downloads. I followed all of the instructions, and I confirmed my email. However the printables will not begin the download. I am not sure what I am doing wrong. I had a problem with the downloads over the weekend- it is fixed now- but I also emailed them to you! I love your amazing race idea. I’m also a fan of the T.V. show. I love themed birthday partyies,and will be using this for my sons 10th birthday party. I subscribed, but nothing downloaded. I’m I doing something wrong lol. 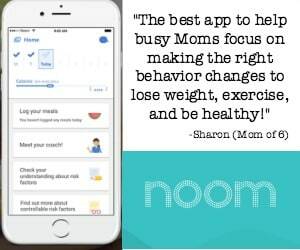 Hi Sharon, I am new to Momof6 – what a wonderful resource – thank you. I have subscribed to the newsletter and confirmed my subscription but haven’t received a download. Does this come through via my e-mail? 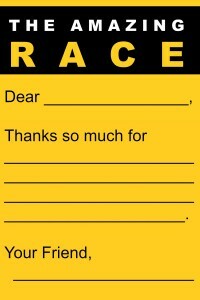 I am looking for the Amazing race printables. I am planning an Amazing Race Party for my 11 year old daughter, she is so excited! Los créditos rápidos son cada vez un productos de financiación más extendxido y puedes contratarrlo en muchos tiupos de entidades diferentes. Hi Sharon, i’m not sure what i’m doing wrong…I have saved the printables to my computer (PDF format) but when I go into PicMonkey to install text onto it, it says “we can’t open that kind of file” ? Take the .pdf file and do a Save As, and then save it as a .jpg. That will work in PicMonkey! can you help me with the download? All you need to do is to enter your email address, and then confirm your subscription when you receive the email confirmation. Upon confirmation the printables will automatically download to your computer or device! This totally saved me! I was able to pull everything together in two hours thanks to your help. My son wanted an Amazing Race party, and I had no time to plan. Your ideas were great, even for 14-year-olds. I subbed a Lego building challenge for the Hack-Sack race, and had them go to a park to spell out his age with their bodies. I also threw in a challenge where they had to match his old school pictures to embarrass him a little. The marshmallow shooter was a great touch as well. Thank you so much for the ideas! I am SO glad to hear that you were able to use my ideas and that you all had so much fun at your Amazing Race party! 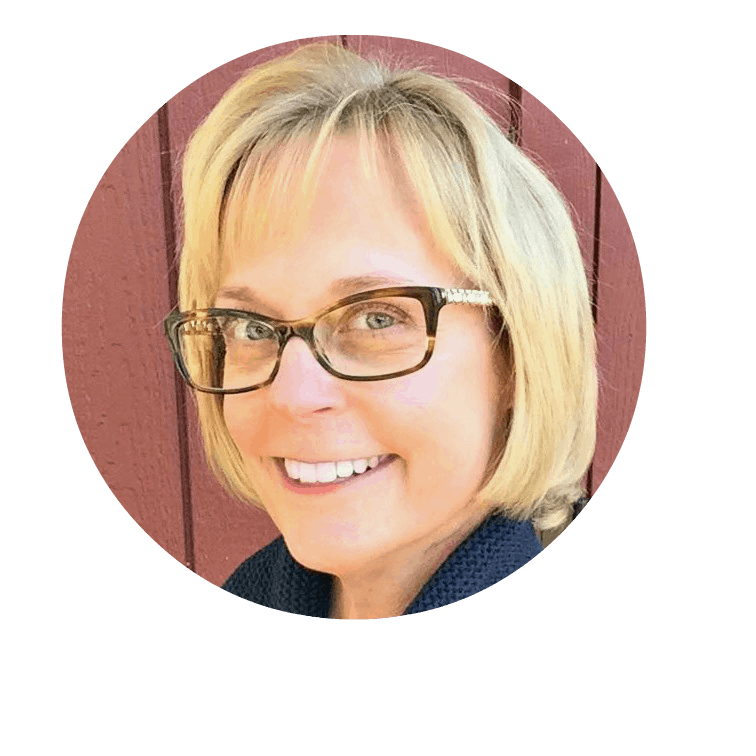 Thanks so much for taking the time to stop by and leave a comment! Hi. Could you please explain how you incorporated the chocolate bar prizes? I don’t see anything about how they were used or what they looked like. Thanks!! We just gave them out at the end of game- Hershey bars in various sizes- giant ones for 1st place, regular size one for 2nd place, and fun-size bars for everyone else. It just added to the fun! great, thank you! awesome birthday party idea! Joy, the picture idea is cute….do you mean that you took all his school pictures K-8th grade and had to put them in order? Also, being that this is a game done in pairs of twos, what exactly did you do for the park and the kids spelling out your son’s name? I don’t understand that one. Thanks!!! Thanks for the great idea and all the work you’ve done on this. I was wondering if you could explain what you did for the chocolate bar prizes? This is great!! I am planning an amazing race team building event for my team at work, and these ideas really got the ball rolling. How long did it take the kids to complete this race? 2 hours at most. With a snack break or two in the middle! We’re just putting together a birthday challenge for Miss turning 10… unfortunately a friend of hers has already done an Amazing Race so we’re staying away from that as a theme… but same concept. I’m just wondering if you had “declared winners”at the end of each challenge… or if each team just then went on to the next challenge as they finished? No- we just went on to the next challenge- same as the TV show! This is super! Thanks for creating and sharing. As an educator and mom, I don’t have a lot of time. This is like a present for me! My daughter and her friends will love this. About how long did it take for your kids to go through the activities that you posted? It took about 2 hours, with time for a drink and snack break in between! I hope you have a great party! Thanks mum of 6 for all the information. Really well explained and terrific templates. It made for a lovely autumn 11 year old party for 10 girls over the weekend. Reports from school today included – ‘best party ever’ ‘ i just wanted the games to keep going’. Thanks from Australia. This looks AMAZING! I’m going to use this for my daughter’s birthday party. Do you have a rough estimate of how long the race will last? I’m trying to fill about 90 minutes. It can actually go even longer than 90 minutes depending on how long you allow for lunch/cake, and how long it takes them to build the marshmallow launcher! I hope you have a great party! I cannot find the templates. Are they still available? They are right there as images in the post. Simply right click on them to open or to save to your computer. Have a great party! It seems as if the templates are combined as one image. Is it possible for you to separate them? I need more of the route cards than anything else. Would love to print the blank cards, but can’t find them individually. I see all 3 as one link/download, but do you have them individually linked so I don’t have to download and crop the other two cards? Thanks! 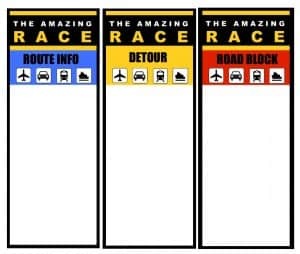 I can not find how to download the blank printable clue cards for the amazing race. I found the pic monkey but not a download for the clue cards. If you could direct me to the download option I would appreciate it. Thank you for posting this it has really been a birthday saver for me. How perfect is this…i was just on the internet to get some ideas for my 11 year old’s birthday party and came across your site. It looks like we also have something else in common, my two girls are from China. Where are your children from? Can’t wait to use some of your ideas at my daughter’s party! Hi Maureen! So glad you found some birthday party ideas you can use! My kids are actually from three different provinces within China- Jiangsu, Guangzhou, and Zhejiang. I came across this post looking for ideas for my 11 year old’s upcoming party. Although we are not into the show, this party sounds like it is going to be so much fun and is perfect for this age group! We will definitely use some of your games and will add more of our own. I appreciate all the free materials you offered as well. Can’t wait until the party! Oh yes- you can definitely use the games for a party with a different theme! I hope you have a great party! Thanks for the great ideas! 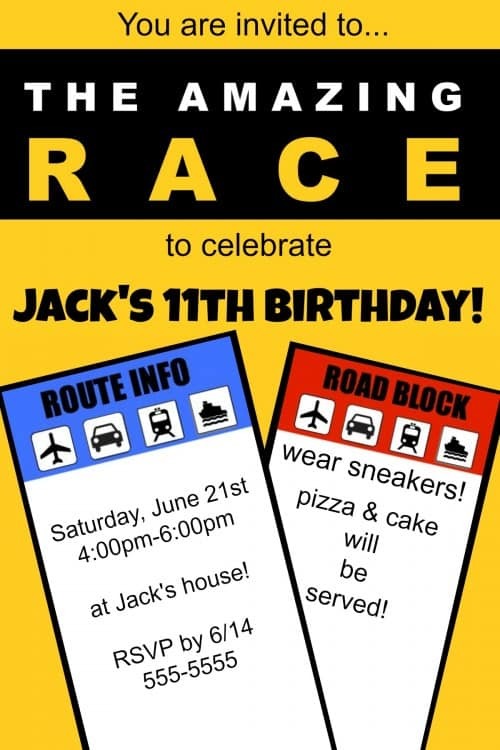 I love the amazing Race show and I am throwing my 10 year old boy a birthday party next week. Used your invite and thanks for the great tips on using picmonkey! It worked out great! Can I use picmonkey to make my own detour/roadbloack/pitstop cards too? Absolutely! PicMonkey is a totally awesome photo and text creating/editing application on the web. I use it for so many things! Including scrapbooking! I can’t thank you enough for this site! I came across this idea 3 hrs before my son’s party was due to start …. and still managed to deliver it ….to cries of “best party ever!! !” no less. Thankyou, thankyou, thankyou!! just wanted to say thanks! for sharing, for posting, for creating. we had a great time at my son’s Amazing Race party and appreciate your great plans and your taking the time to answer silly questions. You are so welcome- I am glad it was awesome! I love all your ideas and am planning on hosting an Amazing race party for my son’s 8th birthday. Is there a way I can print off the ideas you have here? I’m not at all handy with the computer like you must be! I’ve pinned all the things I liked to my pinterest board, but am unable to find a way to click on anything to print. Is that an option?? You just need to right click to open the image in a new window and then you can print off the invites, the cards- everything! I’m having a party for my 10yo and this saves me so much headache. I have many more route cards than detour/roadblocks. Do you by chance have a template of three only “route info” or single (so I don’t have to waste paper when I print). Ps thanks for the tip on Pic monkey, loving it!! I am sorry- I didn’t build them separately. But if you bring the file into PicMonkey, you can crop it, so that you only have Route Info cards and just print that…. I hope you have a great party! Love this party idea! Hoping to do this for my 10 year old! Can you help me clarify for the teams… If one finds the coin with the birth year at the base of the tree…what do the other teams do? Out of luck?. No- they have to keep going until they find the coin- just like on the TV show- you have to complete the task! So make sure you have plenty of coins with the guests birth year on hand! looking fowrard to my son’s Amazing Race Party next week – thanks so much for sharing this! Two quick questions: the link for the marshmallow shooter is not working for me and i found a couple options. curious which one you used? 2. any suggestions for shoeboxes – i find myself short on those.thanks! Okay- I updated the link to a new post on the marshmallow shooter- so click on that and you’ll find the one that we used. Short on shoeboxes? Hmm… maybe go to the post office and pick up a stack of their free mailing boxes- I think the medium sized ones might work and still be “strap-able” to a child’s waist. You’ll have to test it! thank you Sharon. You really are amazing and inspiring. I’m getting into serious party planning mode for Saturday and wondering about a couple things. For the water balloons, did you precut cups and balloons or give the kids scissors (I”m sure either would work just wondering on timing on safety). Also, how did you tie on boxes for Junk in the Trunk/ I’m thinking of either duct tape or using a strip of fabric. Also, fyi on boxes, I did find some fed ex boxes, but at this point I am planning to use emptied-out kleenex boxes and taping up the openings to make them smaller. I’ll keep you posted. and thanks! I loved your ideas for The Amazing Race party and I want to use your Invitation template by editing it in PicMonkey. However the Date, Time RSVP is pre-printed at an angle, so when I use add text option, it allows me to print only straight. Is there a way out ? Also there is no plain white in the overlay options. Hi Sam! You can tilt a text bar in PicMonkey by grabbing it by the circle at the top and then use your mouse to turn it to match the angle you want. Also- the color code for white is ffffff (6 f’s)- just change the color # in the upper right corner. Thanks so much Sharon…the invitation is ready and its looking fab….will keeping following your blog for the useful tips. Yay! Thanks for letting me know Sam! You are an AMAZING lady! I will be doing this for a combined party for my 13 and 15 yr old daughters. The templates were super-helpful! thank you so much! you are amazing. i’m so excite to use all your ideas for my daughter’s 12th birthday party! I hope she loves it as much as my kids did! Have a great party! You are amazing! I am planning a teen version of this for my two daughters. I will enlist staff at the mall. Your printable versions are a God-send! One question…Are you in Canada by any chance? I don’t think Canada Post has free envelopes, unfortunately, but let me know if they do! I’m not- I’m US based so I don’t know if Canada Post has the free envelopes or not. I love the idea of you doing this party adventure at the mall! I can’t wait to hear how it turns out! I teach 5th grade and we do The Amazing Race for US Regions and somehow I can’t find the template I used in the past for the Detour, Route Info and Road Block. Would you be willing to share an editable template? I have a daughter in 5th grade right now, and I am always happy to help out any teacher! All of my printables are free and available for you to download. The blank template is listed right there at the bottom of the post, simply click on it to open and then feel free to save it to your desktop to either edit it (I use Picmonkey) or print it. Thank you so much for sharing your party detail by detail and sharing your creations too. 1. Where did you get your t-shirts? I have been looking at Custom Ink to make the team shirts, but it wouldn’t be cheap. 2. I would love to use your invitation, but I can’t fit my info into the spaces provided for date, time, etc… in PicMonkey. Do you know if there is a way to overlay a text box on this part so that the pre-prints don’t show? Again, many thanks. I am really inspired by this post and look forward to reading around on your site some more! I didn’t print anything on the tees- they were just blank solid colored tees- which you can buy at Michaels fairly inexpensively (or Target/Walmart). And you can definitely overlay a shape on the written part of the invite- in PicMonkey, select overlays, Geometric and then just place a white box over the pre-printed info. You can then just add text where you need it. I hope that you have a great party! Thanks so much for responding! The overlay worked perfectly and now I have my custom invite! I am in the planning stages of my daughter’s amazing race birthday party & found your site. Thank you so much!! I just personalized the invite using PicMonkey (something I’ve never used before) and it was so easy! I’m so excited to use your templates for the clues. Thanks again! So glad to hear that you were able to use my tutorial to personalize your Amazing Race invites! I hope that you have a great party! awesome ideas! my daughter asked for an amazing race themed party and i thought, oh dear, but you have taken care of a lot of the hard work! So glad to hear it! I hope you all have a great party! Thanks so much for the stunning idea of the amazing race party I am about to have my house invaded by teenage boys so this will keep them busy for a while before getting up to mischieve! Iam deffinately going to combine the minute to win it theme aswell on the night before! Yay Linda! So glad you found this to be helpful! I hope you have a great party! My dream is to be on the Amazing Race and that party idea is awesome. You are amazing yourself with all your cool ideas!